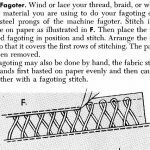 The Singercraft Fagoter was a device made in the 1930’s to help seamstresses create a quick, machine sewn fagotting to use in their dress making. They’re hard to find at a price not aimed at collectors, but if you’re like me and find old needlework gadgets fun to experiment with, they are worth looking out for. They can be used to both create fagotting for seam inserts and braids for stitching on top of your work. Here are a couple of videos from YouTube, showing the parts of the guide and how to use it.